When the carrier you recommend delivers what you promise, it makes clients happy and relationships strong. ICW Group understands how important this is, which is why we deliver the very best products and services to your clients. You can help clients reduce their claim frequency, lower their claim costs, and improve their experience modification factor (ex-mod), by advising them to partner with a carrier that knows how to achieve the same thing. That’s ICW Group, and that’s advice they can trust! Your clients want the best combination of price, service, and dependability. You want a carrier that’s easy to do business with. Learn more about our financial stability, geographical presence, branch office location, and how you can become appointed as an ICW Group workers’ compensation agent. Visit our Join Us site today. Already an ICW Group Agent or Broker? 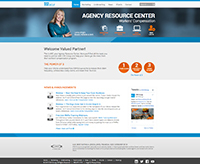 Visit your ICW Group Agency Resource Center, the website created just for you. You’ll find find helpful underwriting tools, Snap login, class codes, sales collateral, marketing materials – everything you need to quote and present ICW Group to your clients.